Two tickets for the Transylvania music festival? That’ll be two pints of blood, please. It may sound like a bad episode of Scooby Doo, but organisers of the Untold festival in northern Romania are offering festivalgoers discounts if they donate blood before buying tickets. Romania ranks second to last in Europe regarding the number of active blood donors, according to data from the National Institute of Blood Transfusion, with only 1.7% of the population donating blood, and most only after someone close to them needed a transfusion. 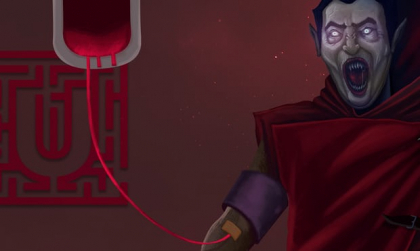 So, using the region’s link to vampires, thanks largely to Bram Stoker’s Dracula, the festival organisers decided to team up with the blood transfusion institute to launch Pay with Blood. “Given that Romania faces an acute blood shortage in medical facilities, a campaign that takes inspiration from these myths in order to draw attention to a real problem is more than welcome,” the festival’s director general, Bogdan Buta, said. The Untold festival, which runs from 30 July - 2 August in the picturesque city of Cluj-Napoca, is offering a 30% discount to anyone who donates blood at one of Romania’s 42 blood centres until 24 July, as well as free one-day festival tickets to anyone who gives blood at a mobile unit that will be set up for two days in Bucharest or at the blood transfusion centre in Cluj-Napoca. “We were talking about how to incorporate Dracula into our festival and after seeing the numbers and how behind Romania was in blood donations we had this idea,” said Stefana Giurgiu, the festival’s PR manager. Forty-five people, many first-time donors, had signed up and given blood by noon on the campaign’s first day. Pay with Blood is also proving to be a slick PR move for a first-time music festival hoping to attract hundred of thousands of visitors to its paid venues and free entry areas. “My phone hasn’t stopped ringing since we announced the campaign,” said Giurgiu.